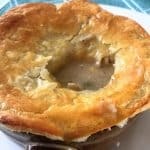 Ultimate Chicken Pot Pie – It does not matter the time of year; to some, Chicken Pot Pie is the ultimate comforting food. Hello Friends! I’ve shared with you some of my favorite comfort foods. But today, I am sharing with you my husband’s Ultimate Chicken Pot Pie recipe. Though it is his favorite, I do not make this very often (another dish I do not make often, right?). 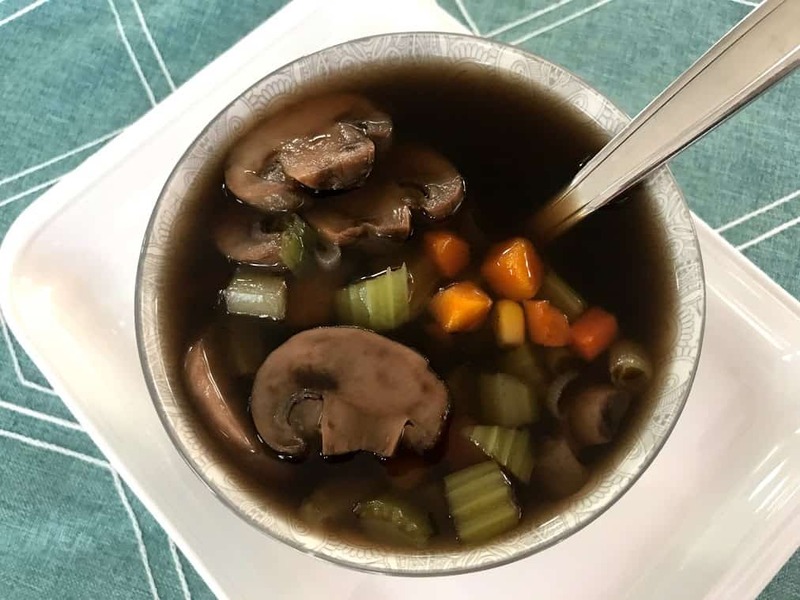 A few days ago I shared with you my to-go-to Mixed Vegetables Mushroom Soup anytime hubby ask for a quick and easy meal, which by the way is done in 15 minutes. I enjoy cooking and sharing simple dishes that are very tasty and filling, and that does not require tons of hours in the kitchen. My husband and I have our own favorite dishes that comes to mind when we think of comfort food. He on the other hand, ever since we met has always expressed his love for Chicken Pot Pies. I took rather a short route to make this delicious dish. The ending result was just as satisfying. The combination of the spices and herbs are simply divine! Depending on where you are from around the world, chicken pot pies can be served for special occasions, or simply a weeknight meal. As stated above, hubby is a huge fan of Chicken Pot Pies. Unfortunately, I do not make enough of it. After you are done with all of the prepping and cooking, the pot pie will be filling and most of all, this pot pie will make you feel warm inside. You may also enjoy The Best Red Beans Gravy. Incredibly easy chicken pot pie recipe that will make you feel warm inside. The combination of the spices and herbs are simply divine! 2 large cooked boneless chicken breasts, without the skin and shredded. You only need 1 and 1/4 cup of shredded chicken. Preheat oven to 400 degrees. Pat dry and roast chicken for 25-30 minutes until cooked through. No need to add salt and pepper. In a separate bowl, thin the cornstarch with the water. Set aside. In large saucepan melt butter, add onion, and celery and frozen vegetables. Cook for 5 minutes. Stir to cook evenly. Add cooking wine and cook for 1 min over medium heat. Add chicken broth and cornstarch mixture bring to a boil and cook 1 min. reduce heat to low. Meanwhile prep chicken. Shred the chicken with two forks. Add to the soup mixture, along with heavy cream, salt and pepper, and parsley. When the mixture starts to boil, add parsley and salt and pepper. And the chicken too. Cover and allow simmering on low heat. Prepare egg wash. Whisk the egg and water together. Set aside. Ladle mixture into oven safe bowls and top with puff pastry, securing the sides to the bowl. Brush the puff pastry with the egg wash.
Bake according to directions on your package of puffed pastry until pastry is golden brown and puffed up. Serve warm. It is best to roast the chicken ahead of time. This can be done hours before. Friends, we made it to another week! 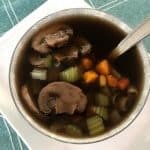 For those of us who are still on a healthy trend, I would like to share my Mixed Vegetables Mushroom Soup with you, which only takes 5 minutes to make on any given night and is made with just a few ingredients. 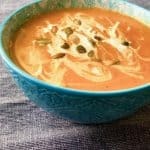 When we think of mushroom soup we usually think of warm, creamy, crowd pleaser, full of flavor mushroom soup, correct? Not this one, but I promise it is as fulfilling. To be honest, I do not make this soup often in our house. Hubby is the only mushroom lover in the family, so from time to time when he asks for something a quick and easy meal, this soup usually comes to mind. This Mixed Vegetables Mushroom Soup is delicious and nutritious. The key ingredients to make this soup are sliced mushrooms, beef broth or vegetable broth, and of course mixed vegetables (frozen vegetables are okay too). Feel free to have this soup with some toasted garlic bread on the side, or pair with a light salad. Whatever your preference, this soup will not disappoint. I love making soups or dishes that are done in one pot or between 15 – 30 minutes. In my opinion, foods that are made between 15 – 30 minutes are usually inexpensive. To make this soup, simply cover and cook for 15 minutes on medium-low heat. Serve warm and enjoy. Try the Kale Arugula Salad for pairing options. Love what you have, and you will have everything you need. Delicious and nutritious Mixed Vegetables Mushroom Soup that only takes 15 minutes to make. This soup is full of flavor and will not disappoint. In a small saucepan, heat the beef broth and frozen vegetables. Add all of the remaining ingredients. Cover and cook for 15 minutes on medium-low heat. Serve warm and enjoy. It is best to use low-sodium beef or vegetable broth if you plan to add salt. Another quick post for your weekend enjoyment. If you are as busy as I am, you know time is precious and thinking of what to eat is the last thing we need to have on our mind. This extremely easy and simple Kale Arugula Salad is not only perfect for a busy day/night, but it’s also perfect for those who are currently on the health trend. After all, it is the new year and what better time to get rid of all of the toxins from the past holiday, then by detoxing our body? This salad is extremely simple. All you need is Kale, Arugula, and dressing. Listen for the still, small voice. 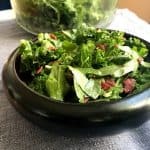 Quick Kale Arugula Salad (recipe) to get your mind off of what's for dinner to handling items that matter the most. In a large bowl, combine the kale and arugula. Set aside. Whisk all the ingredients in the order listed above until well combined in a small bowl. Refrigerate until you are ready to serve the salad. Apply the dressing to the salad, topped with the cooked chopped (I used Turkey bacon) bacon and enjoy! Butternut Squash Soup – There’s nothing more comforting than soup. Soup of any kind. 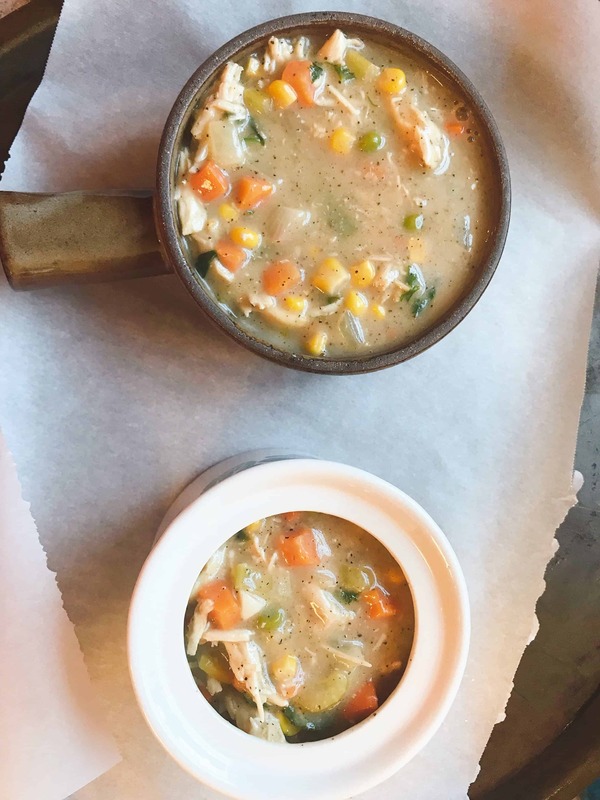 Nothing can compare to a warm, comforting, delicious, bowl of soup that just makes you want to cuddle in a blanket on the sofa/couch to watch a good movie. There are only two soups I often opt-in for when the busy day calls for something quick, easy and delicious; and that’s Tomato Soup Butternut Squash Soup. Today, I am sharing my extremely easy Healthy Butternut Squash Soup that will help ease you into the mood to embrace any weather. Besides the fact that it is out of this world delicious? It is sweet, with a “nutty taste similar to that of a pumpkin.” But what I love about butternut squash the most is that it turns a deep orange color when ripe. It then becomes sweeter and richer. Furthermore, it is very inexpensive. One could pay cents a pound at your local grocery store. Want something more than soup with Butternut Squash? Butternut Squash is cooked and or prepared in many ways. You can roast it, grill it, and even stir fry it. The possibilities are endless. It is also a highly nutritious vegetable. I went to WalMart and bought my squash from there. We often have a great selection to choose from. In addition, I also picked up the Land O’Lakes Heavy Whipping Cream from there as well. A few aisles over, I picked up the Swanson Natural Goodness Chicken Broth. In our home, we actually eat various soups throughout the year, even on those hot summer days. I made it a point to have more soup in the colder days and long nights a couple years ago, versus the bright sunny days in the summer. Butternut Squash is something we always have in our kitchen, so why not make soup with it? The great thing about this squash is that you can buy it any time of the year. There are of course various ways to make this soup. However, with just a few ingredients you will be on your way to a happy place of indulgence in no time! This version of butternut squash soup has a bit of “kick” with a hint of sweetness. Though it is very thick and creamy, it is very easy to make. This soup is as healthy as it is delicious. Find what you love and do not let it go! Healthy Butternut Squash Soup with a bit of "kick" and a hint of sweetness. Thick and creamy. Very easy to make recipe. Wash and cook the butternut squash. Remove the skin. Transfer the cooked squash to the blender. Add water and chicken broth. Transfer to saucepan. Add the remaining ingredients and season with salt and pepper. Cook on low heat for 15 minutes. Serve warm and enjoy. It is best to cook the squash ahead of time for easy peeling and blending. You may add a little more water if the soup becomes too thick. For this recipe, I used kosher salt.